It consists of embossed cloth (or Polyethylene film)、medical hypo-allergenic adhesive and absorbent pad. 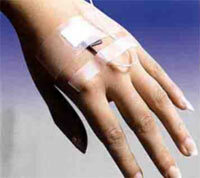 It can be used for injection、blood transfusion、retaining needle pipe fixation. Characteristics: Permeability due to its backing of non-woven mesh,it makes the skin breathe naturally, and excrete water、air and sweat,and also reduce the chance of infection. Hypoallergenic and proper vi scidity will not irritate the skin and be firmly adhered. Do not hurt the skin when released from the skin easily.